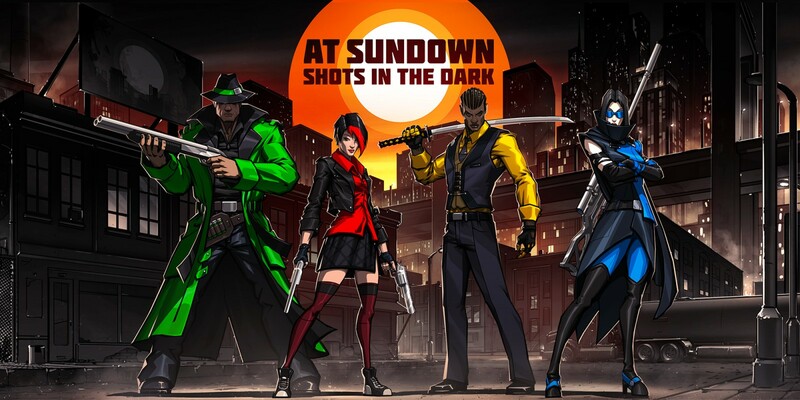 Released on the Nintendo Switch back in January 2019, At Sundown: Shots in the Dark is a shooting game where players are invisible, until they step out into the light, or start firing. In typical interview fashion, would you be so kind as to introduce yourself to our readers and tell us a bit about yourself, your background and your involvement with At Sundown: Shots in the Dark? Ted Park: Hi, my name is Ted Park, and I’m the Project Lead on At Sundown: Shots in the Dark. While at college (USC, Fight On! ), a couple of friends and I decided to make a game about… well, shots in the dark. One thing led to another, and now that little project ended up on the Switch! Back then I was involved with production and business development. Now I’m kind of a code janitor, fixing bugs here and there. And a PR guy, since I’m doing this interview! Miketendo64: For our readers who have yet to experience At Sundown: Shots in the Dark, or heard a single thing about it, what is At Sundown: Shots in the Dark and how does it play? Ted Park: At Sundown: Shots in the Dark is a “hide-and-seek” shooter where you’re only visible if you’re in the light or shooting. It’s all about hiding in the shadows and trying to figure out where your friends are. Once you know where they are, go in for the kill! If you remember the “Luigi’s Mansion” mini-game from Nintendo Land, it’s like that, but everyone’s a ghost. And has a gun. Miketendo64: As an arena combat game with a stealth aspect to it, what prompted the idea for disguised warfare and what was the process like trying to implement it? Ted Park: We like stealth games, and we like competitive multiplayer games, so we thought, can we make some combination of the two? From there, it was about making a prototype, finding that it was fun to sneak around and shoot people, and then thinking about what crazy weapons and maps we could add that would make it even more fun. Dual revolvers? Bows? Disco map that lights up based on the beat? Sure, throw it all in! Miketendo64: Which game or games did you take inspiration from to help shape the game At Sundown? Ted Park: Splinter Cell and Smash Bros. immediately come to mind. We love the tense moments when you’re running away from guards and looking for a shadow in the former, and the head-to-head combat in the latter. Miketendo64: With 6 maps types, with 3 maps per type, are you open to the idea of making more that can be added to the game at a later date? Are there plans for post-launch support? Ted Park: We’re working on a new map type with a new mechanic – stay tuned for that! Miketendo64: It is common to cut ideas out or to change how things work mid-production. How different is the finished product compared to what was originally envisioned? Ted Park: Funny thing about our game – it felt like we added more to the original concept rather than cut things out. The original game was small – 6 maps, 6 weapons, local multiplayer. It was a student game, after all. Now there’s 18 maps, 11 weapons, online multiplayer, single player training… Makes my head spin, thinking about how we added all that as a new team, with little industry experience! Miketendo64: For new players looking to pick up the game, do you have any tips or tricks that they can benefit from? Don’t get seen. The end. Just kidding. Each weapon plays differently and has different primary and alternate fires. For example, the Revolvers have shots that can bounce off of walls, and an alt-fire that shoots out a flare that reveals people. Make sure you are very careful before shooting, as it leaves you very vulnerable if you miss, especially if you have to reload right after. Master all this and you’ll be king of the shadows! Miketendo64: The game unlocks new weapons, modes and stages at a certain rate, what made you decide on this particular system and what was your approach for it? Ted Park: For new players, having a lot of options at first is overwhelming. Especially when you’re dealing with a new gameplay mechanic. Unlocking stuff is a fun way to deal with that, as you get rewarded as you get used to the gameplay. We sat down and thought about what weapons and maps would be the easiest to start with and made them unlocked on start. Then it was about making a progression of unlocks that get more complicated and/or get cooler as time goes on. Just wait until you unlock the Juggernaut… it’s a big golden hammer that you swing around and tunnel through walls with! Miketendo64: Considering that you are dealing with an almost unexplored mechanic, what would you say was the most difficult aspect of it? Ted Park: The hardest part is communicating to players on what is going on when they are invisible. One thing that really helps is when you walk into a wall, the Joy-Con rumble based on what side of the wall you’re on. Miketendo64: At Sundown: Shots in the Dark is a game with a lot of potential to expand. How do you guys see the future of this title? Do you plan to keep supporting it with new content or the finished product is all? Ted Park: We definitely plan to keep supporting it. We’ll keep working on bug fixes, balance patches, and content updates, and keep listening to the community for feedback. Miketendo64: With At Sundown: Shots in the Dark now released, what comes next for you? Ted Park: Working on some new game ideas that may or may not come to fruition. We’re a studio about making games that are fun, so we’re looking for the next thing to keep us distracted for a while. And of course, supporting this game for as long as we can! Miketendo64: Lastly, is there anything you would like to say to your ever-growing fanbase and supporters? Ted Park: Thank you for your support! It’s truly an honor to be able to work on a game that people like playing, even though it’s our first game! You can join us on our official Discord, and find other Switch players to play with here: https://www.discord.gg/atsundown. Come and say hi! Cheers for taking the time to talk to us Ted.